This page includes in-depth information about X'cacel, Mexico's most important nesting beach for the loggerhead and Atlantic green turtle. X'cacel is located approximately 100 Km. south of Cancun, in the tourist corridor Cancun-Tulum. Some of the protected species found in X'cacel's 311 hectares (156 terrestrial and 155 aquatic), besides loggerhead green sea turtles, are the boa constrictor, marsh turtle, crocodile, Chit, and angroves. Photo: Mary Louise Whitlow. All rights reserved. X'cacel along with the adjoining beaches of Aventuras-DIF and Chemuyil are the most important green and loggerhead nesting beaches in the state of Quintana Roo. However, all 3 of these beaches have been sold to developers by Fideicomiso Caleta de Xeh-ha y del Caribe (FIDECARIBE). The Ecological Group of the Mayab (GEMA) in 1994 proposed officially incorporating X'cacel into the National System of Protected Areas (SINAP) and completed all of the necessary requirements, their request has gone unanswered. The Management Plan of the Tourist Corridor Cancun-Tulum (Gob. Fed. 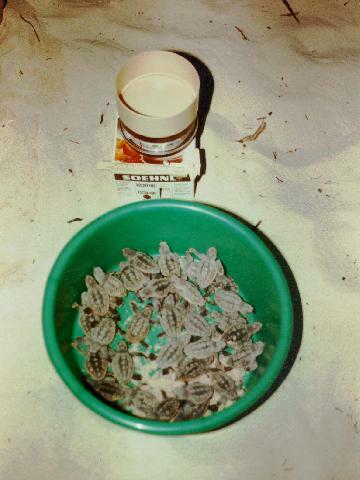 1994a), was signed by the representatives of: conservation groups, sea turtle biologists and representatives of local, state and federal Mexican government. This plan includes the following phrase, "In case of the realization of development projects or exploitation in the zone of X'cacel the following risks to the integrity of the ecosystem and the species in danger of extension that live there, such as marine turtles who depend on these beaches for their reproduction : a) erosion of dunes b) disturbance of the vegetation that controls the flow of water c) contamination and alterations of the physical, chemical and biological characteristics of the beaches d) disturbance of nesting female turtles and their nests e) disturbance caused by the artificial illumination of the beach and adjacent areas f) disturbance caused by noise generated by aquatic activities and g) disturbances in the reef and its platform, potentially able to alter the water flow". The Management Plan recommends that development should not be allowed between the federal highway and the 60 meters isobath, and if the property is to be sold that the conservation groups who have promoted the protection of the sea turtles and the area are given the right of first refusal. Sea turtles conservation and research has been carried out over most of the coast of Quintana Roo. However, these three beaches (X'cacel, Chemuyil and Aventuras DIF) have the highest density of nesting activities and therefore have been the main focus of these efforts. It is public knowledge that the Melia hotel chain of Spain purchased 45 hectares of X'cacel for 2.5 million US dollars. Since pressure has been applied, the governor of the state declared the "Santuario de la tortuga marina X'cacel-X'cacelito"( February 20,1998), this only provides protection to the area from the 60 meter isobath to100 meters up the beach. The governor has been quoted in the local newspapers as saying that the construction of a tourist resort is not in conflict with the protection of X'cacel. The following map shows the shoreline on both sides of X'cacel. The numbered and shaded plots give some indication of the development plans for the area. All 311 hectares of X'cacel need to be protected as a reserve! I cannot understand why the Melia hotel chain was allowed to buy part of X'cacel, the most important green and loggerhead sea turtle nesting beach on Mexico's Atlantic! The construction of a hotel on this site will destroy the nesting area of theses two endangered species. Why was this sale allowed? Please preserve X'cacel as a permanent preserve! COL. POLANCO, MEXICO D. F.
The following articles have been translated from the original Spanish. They were first published in La Jornada, and can be read in Spanish at the web pages of La Jornada: Curtain of Smoke and Paradise in Danger. The coast of Quintana Roo between Cancun and Tulum, the Mayan Riviera, was selected in the seventies for a tourist expansion "the dream of the bankers"--Cancun style--massive, hospitality for the bearers of dollars, predators and destroyers; in the hands of foreign corporations. Fidecaribe, under state jurisdiction since 1993, has already sold 323 hectares (including 26 kilometers of beach front between Playa Aventuras and Chemuyil) to two Mexican corporations and two Spanish corporations. This business transaction has resulted in the revenue of 20 million dollars to date for the government of Mario Villanueva, according to information given to La Jordana by Jose Luis Perez Quintal, director of Fidecaribe. However, it was not declared what the total would be for the sale of the four parts of X’cacel/X’caeclito. Questioned about the value of these pieces of land, he indicated a study by Banco Serfin and the Comision Nacional Bancaria y de Valors that put the value at 8 dollars per square meter of beach in these places. "This is crazy," says Dachary, of the University of Quintana Roo, "these lands should be in more than 100 dollars per square meter, the cheapest hectare costs one million dollars." If the land was sold at the prices Dachary quotes then the revenue for these mega-projects would be more than 300 million dollars. Recently, at a private meeting between those who will be the principle actors in the development--hotel owners, investors and authorities from the 3 levels of government--they spoke of what they hope for within the next decade: 240 thousand hotel rooms, the creation of 300 thousand jobs and 1,200,000 people indirectly supported. The governor has "great" plans for the coastline of Quintana Roo. He sold X'cacel/X’cacelito for a fraction of it real value according to Alfredo Cesar Dachary, director of the Caribbean Center for Sustainable Development at the University of Quintana Roo. Dachary also called the development a "time bomb." "It is a slow death sentence for the green and loggerhead sea turtles that depend upon the solitude of this stretch of beach for their reproduction," said biologist Luis Manuel Ortiz, with the turtle program in Akumal’s Ecological Center. According to the journalist, Fernando Marti, chronicler of Cancun and author of the book "Sueno de banqueros" (Dream of the Bankers), there is a strong possibility that the dream will convert into a nightmare and that the famous tourist corridor will be destroyed by the proven incapability, lack of earnestness and corruption" of the state government in fulfilling the plans of the Territorial Ordinance. But for a country that needs monetary input, "the Cancun effect will be multiplied." Believer in ecotourism, owner of a small hotel, and scrupulous follower of the Territorial Ordinance plan for low density tourism in the Tulum-Sian Kaan corridor, Esther Elordui, laments: "This is going to grow absurdly. Everyone is going to construct as they want. Violating the Territorial Ordinance, they are like a rat that will finish everything in a hurry. They are going to kill the hen that lays the golden eggs." Over-worked in the Caribbean Center for Sustainable Development, the specialist Dachary puts in serious doubt the objectives of "low impact tourism", found in the laws and plans of the Territorial Ordinance for the expansion of the Cancun-Tulum corridor. "You do not build a four lane highway for low impact tourism. Nor does an investor spend 10 thousand dollars per meter of beach to build 10 cabanas. The big question now to see how much the Territorial Ordinance can take of the pressure that it is now feeling. And my prediction is that it will not take much." If in Cancun, which was presumably "perfectly planned" before construction began, 75 % of the population lives without a sewer system, how will it be in the rest of the Riviera, where the planning has been useless? There are few (loggerhead and green sea turtle nesting beaches) left (in Mexico), but X’cacel and its smaller twin inlet, X’cacelito, have an importance not only on the national level... the loggerhead turtle population that nests there is considered an important part of the Atlantic population. On the last day of March a forum was held to update the plans of the Territorial Ordinance for the area. More than 50 representatives from the all sectors involved--hotel keepers and investors, functionaries from the three levels of government, environmentalists, ejidatarios (cooperative land owners)--debated 18 months with Fidecaribe (the commission responsible at the state level), the Instituto Nacional de Ecologia or INE (National Institute of Ecology) and SEMARNAP (Secretary of Environment, Natural Resources, and Fisheries) the rules that would govern the inevitable development. The Ecological Group of the Mayab (GEMA), oldest ecological group in the region, proposed in 1994 that X’cacel be incorporated into the National System of Protected Areas, and supported its request with all the necessary studies and the signature of more than 5 thousand people from Quintana Roo. They proposed that the environmental authorities prohibit any construction at X’cacel and X’cacelito, from the 60 meter isobath to the highway. At least five pages of the studies done for the highway amply illustrate the fragility of this ecosystem and its risk of destruction. Another proposal from the specialists from El Colegio de la Frontera Sur, the most recognized sea turtle biologists in the in the area, Benito Prezas and Julio Zurita reinforced the viability of an administered natural reserve. The last day of March the INE gave their last word: the decree does not comply with the "federal reserve status"; the present ecosystem in that site "is sufficiently represented" in the rest of the state and there exists a state decree, Fidecaribe’s, that establishes a low impact plan for these tourist vacation coastal areas. "This is partially true. But all the other ecosystems of the coast with these characteristics...are altered and cut off by tourist projects. X'cacel is the last intact area," maintains Ortiz. Now it has been sold. There have been many comments about the sale of the Fidecaribe lands (X'cacel/X’cacelito) between Akumal and Xel-há, but nothing is known with certainty. The director of Fidecaribe says that a group from Cozumel GA-Sol, headed by Mauro González, bought 48 hectares for 2 million 280 thousand dollars, and another 45 hectares was acquired by the hotel group Meliá with headquarters in Mallorca, Spain; both have paid in full for the properties. There is between 45 and 50 hectares left in the inlet of X'cacelito, for which there are five prospective buyers: two Italian, two Spanish, and one American group. Instead of federal reserve protection the low impact Territorial Ordinance will be used, which establishes a maximum of 10 rooms per hectare but it does not limit the effect upon the dune or mangrove. "Although it is called low impact they can build up to 3 thousand hotel rooms. My diagnosis is that in these conditions the last nesting marine turtles in Mexico are going to disappear." Ortiz is not an orthodox conservationist. He recalls the other ecotourism plans he has presented, including INE, and rejected by Fidecaribe and the hotel owners. What they envision are mega-projects, large three story buildings, golf courses, massive impact". For now, he is guiding these reporters to the remains of what was once the sea turtle camp and which INE left in the hands of the private park Xcaret. "The dismantling of it is not certain," claims Jose Luis Perez Quintal, director of Fidecaribe, interviewed in Chetumal. "The turtle camp will not only be reinstalled but reinforced. We know that an ecosystem is like a crystal ball. We have to not use it or use it with caution. That is what the management plans are for." And that is precisely the problem, notes Francisco Rosado May, expert in management at the University of Quintana Roo. Coordinator of the Territorial Ordinance Project of the Mayan Coast, the academic refutes: "There is not a sustainable monitor in the Mayan Riviera that guarantees the fulfillment of the plans," adding that "...the management plans are made on wheels, negotiated with smoke and without any guarantees." Meanwhile in paradise... the new owners of the inlet ordered a sign be built that says: "Entry prohibited, private property. Sol-Melia." These are the famous owners of the hotel chain Melia, owner of at least two monstrous hotels in Cancun and one in Cozumel. What is known is that Melia is not interested in low impact tourism. They can, declares the pragmatic Cancun businessman Carlos Constandse, promote the hotel at X’cacel as the only one in the world which you can enjoy the beach like the turtles do. With this publicity it will be full all the time. Note: Melia tore down the turtle camp’s building at X'Cacel the same week the above articles were printed, even though it was within the "protected area."